If there’s one thing that socially responsible businesses have learned, it’s that they can’t go at it alone. Whether it’s implementing responsible sourcing initiatives or creating a positive corporate model to make an impact on sustainability, there is strength in numbers. So where did Ben & Jerry’s turn for help and inspiration for its latest ice cream flavor? Colorado-based New Belgium Brewing. Never has the phrase “polishing off a pint” been so perfectly poised in any partnership for a delicious double-entendre. Collectively committed to making a better impact in their global communities, the two B Corp companies proudly introduced Salted Caramel Brown-ie Ale ice cream, which will be featured in Ben & Jerry’s Scoop Shops as well as in pints across the country as a Limited Batch flavor this fall (MSRP $4.89). The concoction consists of New Belgium Brown Ale Ice Cream with Salted Caramel Swirls and Fudge Brownies. The ice cream, arriving on shelves this month, was unveiled Wednesday evening at a Washington D.C. launch “Brew-Ha-Ha” in the confines of the historic Howard Theatre. The launch event was heralded as “a night of music, climate activism, beer, and ice cream.” Musicians Galactic and Dr. Dog performed at the unveiling of Ben & Jerry’s newest ice cream flavor to highlight climate activism. New Belgium Brewing and Ben & Jerry’s jointly pursued a partnership with Protect Our Winters. an organization founded by pro-snowboarder Jeremy Jones, to bridge the gap between the winter sports community and the necessary action to address climate change. “We wanted to partner with a business that shared our progressive values, fun spirit, and desire to take action giving fans an opportunity to act on climate. New Belgium quickly became the perfect choice,” said Jay Curley, Senior Marketing Manager at Ben & Jerry’s. A portion of the proceeds from the ice cream and the beer will benefit Protect Our Winters. Attendees at the launch event were encouraged to request action via governors in their home states to embrace Protect Our Winters and the Clean Power Plan to reduce carbon emissions. 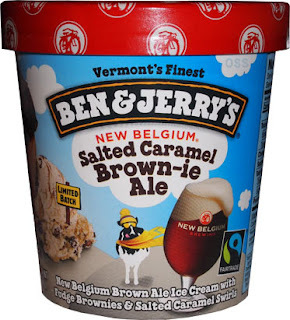 Ben & Jerry’s and New Belgium combined forces on a Ben & Jerry’s-inspired beer as earlier announced by the brewing company in April 2015. Although the beer is just hitting markets now in October, the story made a springtime splash with the announcement of Salted Caramel Brown-ie Brown Ale. New Belgium’s Salted Caramel Brownie Brown Ale, a limited special release, is laden with dark roasted malts, chocolaty tones and hints of vanilla. Both the beer and ice cream are available now through the holiday season while supplies last. Protect Our Winters (POW) was started in 2007 by pro snowboarder Jeremy Jones who witnessed first-hand the impact of climate change on our mountains. After having been turned away from areas that had once been ride-able and seeing resorts closed due to lack of snow, Jeremy saw a gap between the winter sports community and the action being taken by us all to address the problem. Snow-based recreation in the United States is estimated to contribute $62 billion annually to the US economy and supports over 940,000 jobs. So when we look at the cost of inaction, it’s serious business. We are the environmental voice of the global snow sports community, united towards a common goal of reducing climate change’s effects on our sports, our industry and local economies through education, advocacy and community-based activism. POW was founded on the idea that the collective power of the winter sports community is massive, and if we can all work together, the end result can be revolutionary. Together We Can Protect Our Winters. www.protectourwinters.org. New Belgium Brewing, makers of Fat Tire Amber Ale and a host of Belgian-inspired beers, is recognized as one of Outside Magazine’s Best Places to Work and one of the Wall Street Journal’s Best Small Businesses. The 100% employee-owned brewery is a Platinum-level Bicycle Friendly Business as designated by the League of American Bicyclists, and one of World Blu’s most democratic U.S. businesses, and a Certified B Corp. In addition to Fat Tire, New Belgium brews ten year-round beers; Ranger IPA, Rampant Imperial IPA, Slow Ride Session IPA, Snapshot Wheat, Shift Pale Lager, Sunshine Wheat, 1554 Black Ale, Blue Paddle Pilsener, Abbey Belgian Ale and Trippel. Learn more at www.newbelgium.com. As an aspiring social justice company, Ben & Jerry’s believes in a greater calling than simply making a profit for selling its goods. The company produces a wide variety of super-premium ice cream, yogurt and sorbet using high-quality ingredients. Ben & Jerry’s incorporates its vision of Linked Prosperity into its business practices in a number of ways including a focus on values-led sourcing. In 2014 the company plans to complete its transition to using entirely non-GMO (genetically modified organisms) ingredients by source as well as to fully Fairtrade-certified ingredients wherever possible, which benefits farmers in developing countries. Ben & Jerry’s products are distributed in 35 countries in supermarkets, grocery stores, convenience stores, franchise Ben & Jerry’s Scoop Shops, restaurants and other venues. Ben & Jerry’s, a Vermont corporation and wholly-owned subsidiary of Unilever, operates its business on a three-part Mission Statement emphasizing product quality, economic reward and a commitment to the community. Ben & Jerry’s became a certified B Corp (Benefit Corporation) in 2012. The Ben & Jerry’s Foundation’s employee-led grant programs totaled $2.5MM in 2014 to support economic and social justice, environmental restoration, and peace through understanding. For the inside scoop on Ben & Jerry’s visit www.benjerry.com.